The Denver Nuggets will put it all on the line when they host the Portland Trail Blazers on Monday night — the same team that knocked them out of playoff contention last season. There are scenarios in which the Nuggets can afford to lose this game, but not without a lot of help. This game should be approached as a must-win, which begs the obvious question — if Gary Harris is even close to ready, will the Nuggets use their most consistent player? 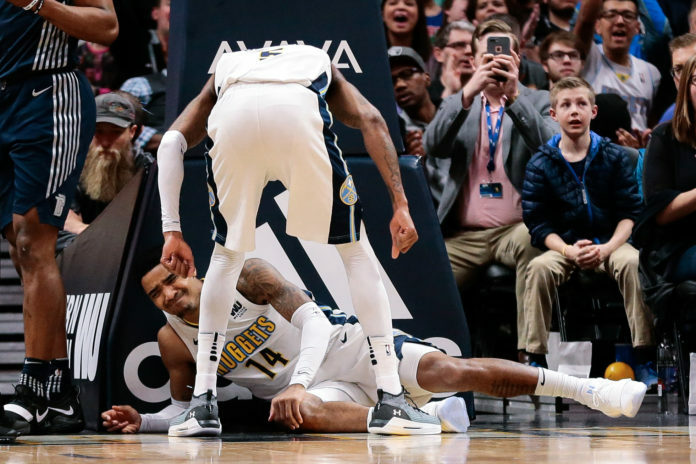 According to Adrian Wojnarowski of ESPN, Gary Harris is likely to return to action on Monday night when the Nuggets take on the Trail Blazers at the Pepsi Center in downtown Denver with massive playoff implications on the line. Harris has missed 13 games since he fell hard on his right knee following a dunk at home against the Detroit Pistons back on March 15th. Immediately after the fall, Harris seemed to know something was wrong right away. Harris spent some time on the ground writhing in pain and eventually walked himself off the court, presumably headed either for the locker room or straight to the X-Ray room, where he eventually wound up. The X-Ray results were negative, but a subsequent MRI revealed that Harris had a slight strain in an unspecified ligament. He hasn’t played since. Harris was listed as out for the remainder of the March games and for the start of the final month of the regular season. Nuggets’ head coach Michael Malone has spent weeks answering questions related to Harris’ status and, ahead of Denver’s crucial matchup with the Los Angeles Clippers on Saturday, he told the media that the team was preparing to finish the regular season without him. Despite Malone’s comments, however, a video surfaced of Harris warming up ahead of the Clippers game, and he looked to be moving well. 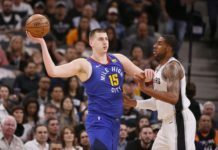 A small pocket of hope began to began to form among the Nuggets faithful and that hope is now bubbling to the surface following two consecutive status upgrades for Denver’s young guard. Harris was upgraded on Sunday afternoon from out to doubtful for the Portland game. Less than 24 hours later, Harris has been upgraded once again; this time from doubtful to questionable the morning before the Nuggets are set to take on the Trail Blazers in a game with massive playoff implications. According to Chris Dempsey of Altitude Sports, Harris will be monitored throughout his pregame workout and a decision will be made before tipoff, and now, with Wojnarowski reporting that Harris is likely to play, Harris’ availability has come full circle in just under 48 hours as he gears up for his return. The Nuggets have invested long-term money in Harris and he is clearly a fixture in their blueprint for eventual contention in the Western Conference. To rush him back when he’s not healthy is undoubtedly a risk, but desperate times call for desperate measures, and tonight’s game certainly qualifies. Harris has often been described by Malone as the most consistent player on the Nuggets roster. 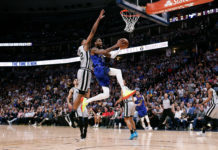 His ability to affect the game on both ends of the floor is not easily found in Denver, and few players, if any, provide the steady shooting that Harris does. His guiding hand has steadied this rocky Nuggets’ ship time-and-time again this season and he’s been sorely missed down the stretch. When Harris went down, he led all Denver players in scoring with a 17.7 per game average on 48.6 percent shooting from the field and just under 40 percent from deep. Harris has the strongest connection with Nikola Jokic of any player on the roster and their chemistry is what unlocks the most potent version of Denver’s half-court offense. They need him in just about any game, but they really need him for this Portland matchup. In the previous meeting between these two teams, Denver held on for a 104-101 win at home. Harris was spectacular on the defensive end. He harassed McCollum with a relentless and physical defensive effort, holding the renowned bucket-getter to just 12 points, but his most important defensive play came at the end of the game when he denied Damian Lillard a chance to win the game not once, but twice. 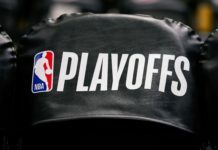 The Nuggets will approach this cautiously and Harris will likely be a game-time decision, but don’t be surprised if No. 14 hits the court tonight. Denver simply can’t let Portland slam this door shut for the second straight year.